With financial pressures continuing to be felt throughout the UK, disposable income has become a luxury which few people can afford. This means those struck with unexpected bills or payments are left to struggle with their finances – prompting them to look for alternative sources of money. Credit cards have long been considered one of the fundamental inclusions of any purse and wallet and this is largely due to the advantages they offer those strapped for cash in times of need. Credit cards are designed to postpone payments, allowing you to buy goods or pay for bills on credit – paying the total balance to your credit card company at the end of the month. However, whilst Brits are more than familiar with the way in which credit cards work few people are aware of how to find the best one for them. As one of the main forms of credit and financial lending on the market, there is an extensive selection of credit cards for consumers to choose between – so what should you consider? 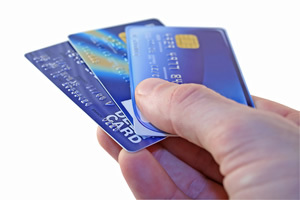 The main feature which any prospective credit card users should review is the interest rate. This is provided as an annual figure (APR) and represents how much the user will have to pay on top of the initial cost of the purchase. However, it is important to remember that interest rates do not only differ between different cards and lenders. When you apply for credit card you will be quoted an interest rate which will be correct for that time. Whilst many lenders will offer fixed APR for a set period this will never be indefinite and means your interest rate could change a year or two after you obtain the card. Regularly comparing interest rates which are offered by different lenders is therefore essential. Conscientious consumers should monitor new products which are being launched onto the market as they become available and should never be scared to switch lenders if they find a card which is offering a better deal. However, be careful not to apply too often for different cards, as a large amount of credit searches against your name could negatively affect your rating. The next consideration which should be made is the credit limit of the cards. This represents the maximum amount which can be spent on the card and should reflect the amount of spending which you are likely to do. Whilst it may be tempting to always select the card with the highest credit limit this is inadvisable. Selecting a card with a credit limit which is too high could see you face extortionate repayments – especially if you are late paying the bill. Lastly, you will need to consider your credit rating and how it will affect your ability to obtain a credit card before making your decision. Individuals with a poor credit rating may be restricted on the type of card or the credit limit they are offered but you can still find credit cards for bad credit. Borrowers should make sure they consider these carefully to avoid being drawn into a false economy and should make sure they only use the card for small expenditures to begin with. This will make it easier for them to pay the credit card bill at the end of the month which in turn will help to improve their credit rating, making it easier for them to obtain finance in the future.